Figure 439. REmatrix Solo module. The REmatrix Solo module by Overloud is a world-class convolution reverb that includes 100 impulse responses (IRs) designed by MoReVoX. You can also import your own IRs and control the EQ, length, delay, and stereo field of any single IR. REmatrix combines the high fidelity of a convolution reverb with the flexibility of an algorithmic reverb. The included presets were created in real mixing sessions, and are ready-to-use for music production/mixing. Clipping LED. Shows if the input signal to the REmatrix Solo module is clipping. If there is any distortion in the ProChannel signal chain, the clipping LEDs let you identify where the clipping occurs. REmatrix Solo enable/disable . Enables/disables the REmatrix Solo module. Preset. Shows selected preset name. Click to select another preset, or use the left and right arrow buttons to scroll through the available presets. Time. Sets the overall duration of the reverb. Delay. Adds a pre-delay before the initial processing of the IR takes place. This control allows you to adjust the response time of the IR. Stereo. Adjusts the stereo width. EQ Gain. Adjusts the EQ gain of the processed signal. EQ Freq. Sets the center frequency of the EQ. EQ Q. Sets the width of the EQ's center frequency, which determines the amount of surrounding frequencies that will be affected when adjusting the EQ. The width of the Q is expressed in terms of octaves. At the minimum value, the EQ functions as a High Shelf filter. 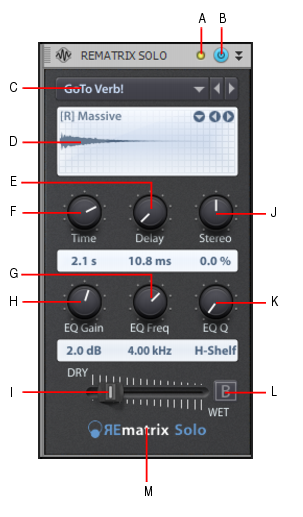 At the maximum value, the EQ functions as a Low Pass filter. Dry/Wet. Adjusts the balance between the unprocessed (dry) and processed (wet) audio signal. Bypass. Temporarily bypasses the REmatrix Solo module. About. Click to show the About box. 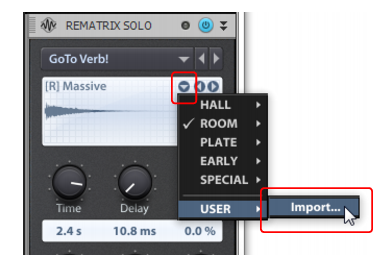 Click any empty space to return to the standard REmatrix Solo interface. To import your own IR files, click the down arrow button in the IR display section, point to USER on the pop-up menu, then click Import. REmatrix Solo supports .wav and .aiff files. Any imported impulse responses can now be selected from the same User menu. Tip: REmatrix Solo adds all your IRs into one big file named userIRs.rir which is located at C:\Users\Public\Documents\Overloud\REmatrix Solo\userIRs.rir. To prevent the User menu from getting too unwieldy, you can rename the userIRs.rir file (e.g., userIRs_original.rir) so any existing IRs don’t appear, then experiment with loading the new IRs. This will create a new userIRs.rir file. Make a note of which IRs are your favorites, delete the userIRs.rir file, then rename the userIRs_original.rir file back to userIRs.rir, and finally re-import only your favorite IRs.